Alto arias from Handel’s oratorios are not in short supply, so why on a disc whose subheading is precisely that, ‘Handel Oratorio Arias’, do two overtures occupy 14’30”, reducing the time allotted to the vocal items to 53 minutes? Why, for example, could a second selection from Israel in Egypt, ‘Their land brought forth frogs’, not be included? The two overtures are lovely music and they are very well played by The King’s Consort but they are not arias. If a buy a jar of apricot jam I don’t want to find strawberries in it, much as I enjoy the latter. The King’s Consort is a period-instrument orchestra, and I noticed in the listing in the booklet that with one exception all the bowed instruments are original yet the winds, theorbo, harpsichord and chamber organ are copies. Crispian Steele-Perkins’s trumpet is of his own make, after a William Shaw model of C. 1787. Together, the orchestra creates a lovely sound. (How I love the minuet in the Samson Overture, played here with a sprightly touch.) A euphonious partnership is formed with Davies. There is an abundance of slow-moving pieces. Two very slow arias occupy consecutive tracks: ‘Your tuneful voice’ (Semele) and ‘Yet can I hear that dulcet lay’ on tracks 9 and 10 respectively. Would it not have been better to have separated them? They do, however, show that Davies can hold an even line, and where would one put them anyway? As in the Hyperion recital, Davies’s phrasing is to be admired, spanning as it does long lines of breath control, very noticeable, as just one instance, in ‘Eternal source of light divine’, which is not one of my favourite Handel arias but which does enable the listener to hear the smoothness of Davies’s vocal production. ‘Up the dreadful steep ascending’ and ‘Thou shalt bring them in’ brought me special pleasure. His tone is soft-grained, very attractive, but on this disc that presents something of a problem, which has nothing to do with his singing. The producer of this CD, Adrian Peacock, and one of the two engineers, David Hinitt, were also responsible for the superior sound on the Hyperion recording. 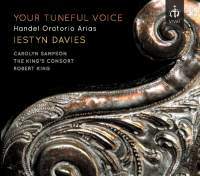 This Vivat disc sounds as tough a covering has been placed over the singer’s microphone in some places, muffling the immediacy of Davies’s sound, while in others too much reverberation spoils the performance . That can be heard in ‘How can I stay when love invites’ and in ‘Mighty love now calls to arm’, the quickest arias on the disc. In the latter, Davies’s words are difficult to decipher. 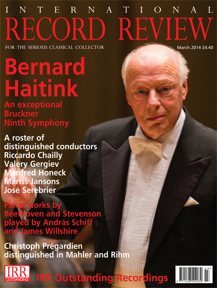 I have always welcomed the sight of Hinitt’s name on a recording, so if he and Peacock did so well in providing what I described as ‘an excellent recording’ for Hyperion, what has happened here? The different constituent is the venue: the church of St Silas the Martyr in London for the previous disc and the Menuhin Hall, Cobham in Surrey for this one. I played the Hyperion recording of ‘Yet can I hear’ immediately after trying this later version again and found the older one to be much clearer. If I have ‘gone on’ too much it is because I was so much looking forward to listening to this new recital, and it cannot be denied that much fine singing is to be heard (from Carolyn Sampson as well as Davies in ‘Welcome as the dawn of day’). The orchestra has come through unscathed, for which many thanks. As I have said before, we hear sounds differently and I am sure some listeners will not share my disappointment regarding the recording. I have no complaints when it comes to Davies’s performances, as in another aria which I liked, ‘Tune your harps to cheerful strains’ from Esther, which on the first occasion that I heard it was sung by a tenor (William Herbert on a L’Oiseau-Lyre LP), a point discussed by Donald Burrows in his note. To sum up: if you like the recorded sound you should find much to enjoy from Davies and Robert King’s players. Thanks to Vivat for supplying texts.